On May 16 I presented at the ElNet Sydney Workplace Learning Congress. This is a post on the experience. “Flipping Performance” – a mash up of flipping the classroom, Performance support for L&D professionals and the 70:20:10 model. My initial response was puzzlement. There were a lot of ideas in that theme, but it was a mashup of potential. How to turn it into a coherent topic? And one that I could plausibly add value to for this audience? I left my subconscious to ponder that as I turned my attention back to my work day…. I distinctly remember this being a brainstorm of ideas with myself, free typing ideas as they came. And then, wondering if I should release what were clearly embryonic thoughts, or wait & polish. I can be wary about sharing half finished thoughts…but it was late, I was tired – and – (perhaps most significantly? ), I was in the middle of #rhizo14. The mindset of exploring possibilities had infected me. I clicked ‘send’. Learning #1: sharing half baked ideas is good. In the last 8-12 months, I’ve explicitly been trying to take a more performance-focused approach to the way I handle learning requests, and the design of elearning experiences. The original inspiration for this came from Cathy Moore’s post “Is training the answer? Ask the flowchart”. This post really changed the way I viewed my role as a designer, by demonstrating how performance support could be pitched alongside a (smaller) training solution – and moreover – how these opportunities might be shaped through careful questioning in the initial client conversation. I started trying to apply Cathy’s strategies in my own client conversations immediately after reading her post. 6 months later, and I’m reading Christy Tucker’s post “Selling storytelling in learning”. Although Christy’s post is nominally about ‘selling’ a narrative or scenario approach to clients, what intrigued me was the way she had woven business objectives and measures into the scripted conversation; it resonated because I was having some of the same conversations with clients too, and starting to consider ways to evaluate long term impact of learning solutions with the business. I even ended up having an interesting and valuable conversation with Christy about in it the comments of her post. It was the combination of Cathy’s initial post, which got me changing my approach to client kick off conversations; plus Christy’s scripted conversation with its cleverly organic interweaving of business objectives and measures, that inspired the idea for “what” I’d present at ElNet. 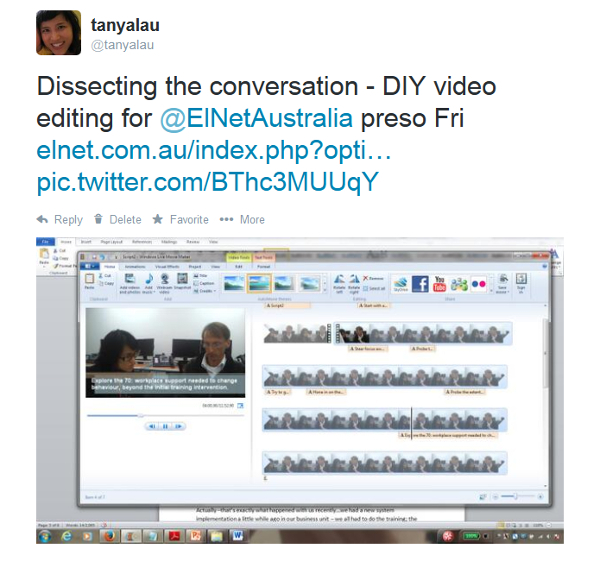 And…it was Ryan Tracey’s blog post “An offer they can’t refuse”, on Do-It-Yourself (DIY) or ‘home made’ video shot on a smartphone (including the conversation we had in the comments) that inspired the “how”. Learning #2: your PLN is an invaluable source of inspiration. The idea was to script and (smartphone) video a (fictionalised) client conversation for a typical request for compliance training, showing 1) how the conversation typically proceeds (i.e. how I used to conduct these conversations) vs 2) how these conversations can be ‘flipped’ to focus on performance rather than compliance, by asking different questions (i.e. how I now conduct these conversations). I wanted to ‘dissect’ conversation #2 – identify the points at which the direction of the conversation can be changed; and ultimately, the outcome – from training only (’10’) to a combination of skills / practise focused training (’10’) + social support (’20’) + performance support (’70’). Conversation #1 was pretty easy to script – it was a familiar conversation I’d had many times, over many years – one which revolved around a structured set of questions to identify the client’s training requirements: target audience, learning objectives, scope of content, tracking etc. Conversation #2 was a bit more work. Although I was able to draw heavily on a number of conversations I’d had over the last 6-8 months, identifying key moments or turning points in these conversations, and condensing what is typically an hour-long kick off conversation into 10 minutes of key moments – whilst still having it flow and make sense as a conversation required more thought. Fortuitously, as I started scripting this conversation, another of Cathy Moore’s posts “How to kick off a project and avoid an info dump” landed in my inbox. This was one of those weird moments of serendipity, as her post covered exactly the type of conversation I was trying to script. It helped me to get clarity on what I was trying to achieve, and in particular, her point about using questions rather than advice to get the stakeholders to see the solution for themselves is genuis, and something I tried to integrate into my conversation script too. Next, because this was going to be video, I needed to cast someone to play the role of the ‘client’. I knew there were casting sites where you could source volunteer student actors and the like…I did a search and found StarNow, an excellent site where you can post (for free) listings to scout for acting talent, models, musicians, crew, photographers etc. They have an extensive directory of talent ranging from professional to student / amateur; it’s very user-friendly, and listings can be posted as paid or unpaid jobs. I posted my (unpaid) listing, and within a day had a response, from Michael O’Grady. As I geared up to shoot the video, I did some research on smartphone video – and found the excellent “Pocket Filmmaker” series by Jason Van Genderen on CNet. The videos on tripods & stabilisers, and audio were really helpful. The two things I felt were necessary to ensure my video was watchable were 1) no hand-held shakiness 2) audible speech. 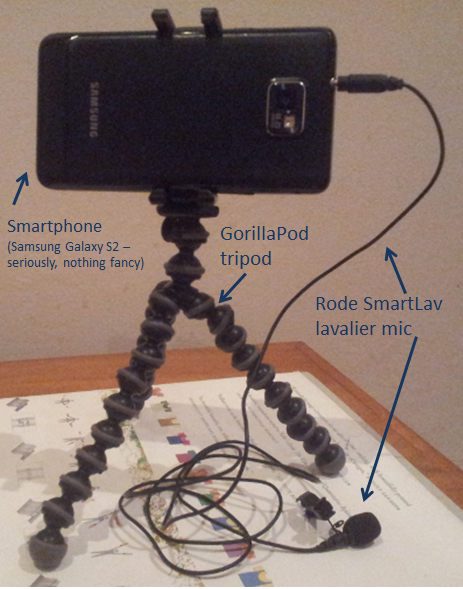 On recommendations from the Pocket Filmmaker, I got a Joby GripTight GorillaPod and a Rode smartLav, a lavalier mic that plugs into the headphone jack of a smartphone. I was quite interested to experiment a bit with smartphone filming, as there are a couple of work projects that I’m considering doing similar DIY video for. So this presented a good opportunity to test out some equipment and setup. I’d intended to take a photo of the setup during filming so I could do this “behind the scenes” post, but in the midst of shooting, forgot. 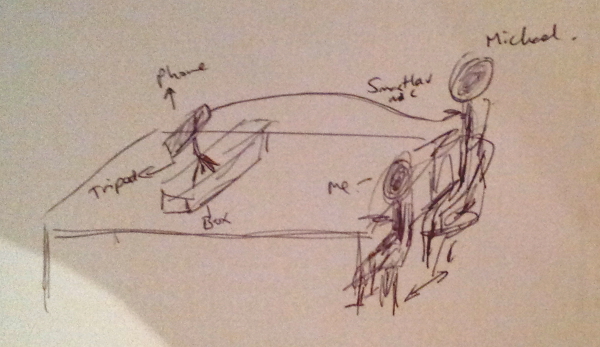 So, here is my dodgy sketch of the setup. Since I only had one lavalier mic (I would get 2 next time…), we clipped it to Michael, and sat fairly close, so that it was effectively pointed between us. His voice still picked up louder than mine, but some post-production audio editing corrected that sufficiently. We put the phone and tripod on top of a box, so that we could get a level framing of our heads in shot. I didn’t draw it in the dodgy sketch, but we also had our scripts on the table in front of us for reference. We framed the shot so these were out of view. Learning #3: be resourceful. Use new experiences as an opportunity to experiment. Start with an open question (e.g. ask for project context / background) rather than scoping the specifics of the requested solution. This opens up opportunities to follow up with questions clarifying the business objectives. In most kick off conversations, the client will want to talk solutions. Steer conversation away from this, back to clarification of business objectives. You’re not in a position to discuss solutions until you know what the problem is. Probe to get specifics on the business objectives – you’re aiming for measureable, time focused objectives. Something you and the client can go back to in 6 or 12 months time to gauge success. Focus your questions on the specific behaviour change required to achieve the business objective. At the core of every compliance requirement is behaviour change- organisations can only be ‘compliant’ with regulatory requirements when their employees are able to action what they know, not merely show what they know (short-term – e.g. in an assessment). Identifying this behaviour or performance outcome is critical to developing a solution that will actually meet the business objective. Ask probing questions to find out as much as you can about the nature of the behaviour change required. It’s not demonstrated here in this discussion but it may also be very useful to go to the work environment of the target audience to see the environment for yourself, and talk to them to get direct insight on their daily challenges, fears, motivations and any other factors that may be relevant. Acknowledge where and how the ‘10’ (formal training) might play a role; but take time to explore the ‘70’: workplace support needed to change the behaviour / achieve the performance outcome – beyond the initial training. Use data or examples from your prior experiences to build a case for the ‘70’. This could come from: previous projects you have been involved in, evaluation (level 1) feedback from employees in previous training rollouts, your own experiences of undertaking formal training, or as a facilitator/trainer/instructional designer. Be clear on the limitations of formal learning approaches (e.g. content in LMS vs easily accessible performance support). Use examples to back you up. Reframe the discussion: from training to performance support (or informal/social – balance depends on the specific requirements of the project). Explore the ‘20’: what social / informal support could be harnessed or developed – this is essentially about facilitating an intentional social environment that can help support people to change behaviour / achieve the performance outcome. Look at what support is available in the target employees’ work environment now, then look at how it can be supported better, and made more intentional. Social learning is not new. It’s already currently happening every day (e.g. every time an employee turns around to their team member to ask where to find a document or how to do a task they are utilising the social / informal support network around them). The goal is to make it more intentional and effective. Position comms and change as part of an integrated learning approach – targeted comms delivered pre and post learning can support a ‘campaign’ approach to the learning intervention. Pre-learning comms can support employees to be more receptive of the change and learning intervention; post learning comms can help support and embed behaviour change (> directing employees to performance support and social / informal resources that can provide ongoing assistance post-training). Encourage the business to develop a relationship with the internal comms team (if you have one). It is ultimately the business’ responsibility to make this happen; although you can provide advice, encouragement, help facilitate it, and collaborate with comms on messaging to ensure it is consistent and integrated with learning. Leverage the business’ previous experience and knowledge of what works in their business environment / work context to identify appropriate ways of measuring success and appropriate performance support strategies. Open up the conversation (& be open to new ideas yourself), share, and exchange ideas –> converse collaboratively to develop holistic, solutions with long term impact. Here is (part of) my presentation which I uploaded to Slideshare. I didn’t include all the videos since it was quite fiddly to do so on Slideshare (had to upload individual videos to YouTube, then insert videos as new slides)…this is probably enough to give you an idea. Overall it was a great experience, and a lot of fun. I thank the team at ElNet especially Michael Gwyther (@mickgwyther), Shai Desai (@LearningPlan) & Leo Gregorc (@mundigoana) for giving me the opportunity and putting on a great event. (Planning to do a Storify covering reflections on the day too…soon). Learning #4: have fun. Explore. Learn. Reflect. Narrate. Share. (blog about the experience). Tanya, this is brilliant stuff. You’ve outlined the how and why of flipping the conversation with out clients to ensure that we focus on the right elements. I love how you explained how you approached the task; how you set up the camera and interview and I had no idea about Star Now! (I’ll be checking that out because frankly, harassing colleagues to be in my short video podcasts is not going so well for me. They see me with a flip cam in hand and they start running in the opposite direction). Thanks for this great post. It wouldn’t be out of place in a text book because you tell your story, the how you did it, provide ways to achieve each step and produce the final result. Great work! I wish I could have been there. Yes – StarNow is awesome, definitely give it a go. I hesitated posting because I wasn’t sure if I was going to get a response, but it worked really well – I ended up getting 2 responses actually, and quicker than I anticipated. I would probably have had to rope or bribe my partner into doing it if I hadn’t have found someone. The other good thing about the site is that it’s not just for acting talent – you can list ads for pretty much any production role, models etc. Thanks again for your support, always! Wow! I’ll be chewing over this post for a while – so much goodness in it! I love that you’ve taken hold of all these delicious theories and ideas and figured out how to get it impacting the coalface in a very positive way. Soozie!! Thank you for your comment – ditto what I said to Helen – means a lot!! Yes I did want to show how it might work in practice – and actually going through the process of scripting a conversation and consciously teasing out the elements and turning points of a conversation was a really way to reflect consciously on some of the things I was trying to do. Of course, this reflects what happens when it all goes according to plan. There are certainly times when even when you throw everything at it, the client still insists on the ‘training only’ approach. I think in those circumstances you’ve just got to acknowledge that you can’t win ’em all and move on. Because supporting the ’70’ and the ’20’ is hugely dependent on the client / business being on board. I remember from when I was a Graphic Designer, some clients want what they want, instead of what is well-designed/artistic/readable/etc. It’s a burden! We can merely show them the way. Oh yes!! Graphic or visual design is a minefield – cos everyone has an opinion about look and feel, but no-one can ever articulate WHY they ‘like’ something over another. I have worked with a lot of graphic designers too. Classic is when you deliver two interfaces and the client wants a frankenstein of them both – a graphic designer’s worst nightmare. I have found usually the best thing is to deliver designs with a rationale on why you have designed something a certain way, and how it ties in with the message, brand or objectives. And just deliver one design. Makes it a lot harder for clients to say no when you deliver a defensible and thought-through design. Very cool re your ascii art story. It is totally something that has a massive subculture built around it isn’t it? That site is wow, amazing what people can come up with…great demonstration of how drawing is simply lines and shapes. Top work, Tanya. You’ve managed to combine learning theory with business reality and pragmatism, providing practical advice to boot. Your conversation guide is something all L&D pro’s should follow – I know I will. It was a pleasure to see you present this at ElNet, and I’m glad you’ve blogged about it so I can pore over the details. Oh, and Michael was great too! Ryan, thank you for your comment, your support – and, of course the original inspiration to do the video. Your blog post was turned on a lightbulb, generated some great discussion and was a big part in getting me over the mental barrier of seeing video as a high end production requiring pro skills and equipment to seeing the possibilities of ‘yes, I could do that’ – and actually going out and doing it.